The Spanish Civil War took place from 1936 to 1939 and was fought between the Republicans, who were loyal to the democratic, left-leaning Second Spanish Republic, and the Nationalists, a falangist group led by General Francisco Franco. Although often portrayed as a struggle between democracy and fascism, some historians consider it more accurately described as a struggle between leftist revolution and rightist counterrevolution. Ultimately, the Nationalists won, and Franco then ruled Spain for the next 36 years, from April 1939 until his death in November 1975. On 1 August 1936, a pro-Republican rally of 20,000 people confronted Blum, demanding that he send aircraft to the Republicans, at the same time as right-wing politicians attacked Blum for supporting the Republic and being responsible for provoking Italian intervention on the side of Franco. Germany informed the French ambassador in Berlin that Germany would hold France responsible if it supported “the manoeuvres of Moscow” by supporting the Republicans. 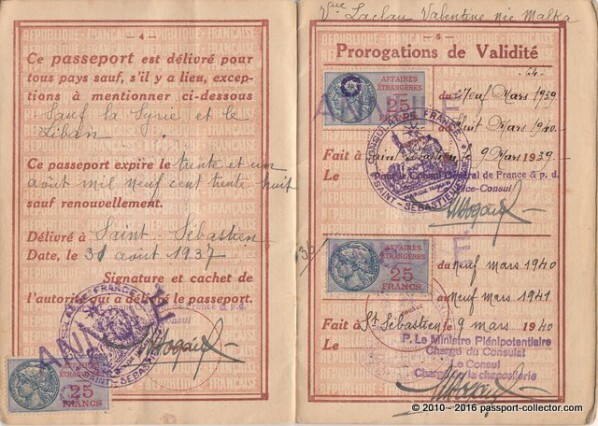 On 21 August 1936, France signed the Non-Intervention Agreement. However, the Blum government provided aircraft to the Republicans through covert means with Potez 540 bomber aircraft (nicknamed the “Flying Coffin”) by Spanish Republican pilots), Dewoitine aircraft, and Loire 46 fighter aircraft being sent from 7 August 1936 to December of that year to Republican forces. The French also sent pilots and engineers to the Republicans. 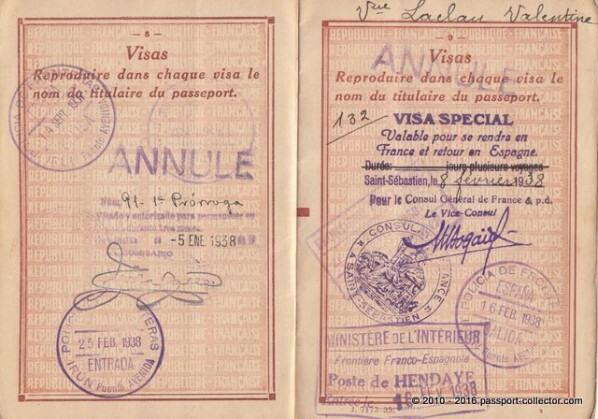 Also, until 8 September 1936, aircraft could freely pass from France into Spain if they were bought in other countries. French novelist André Malraux was a strong supporter of the republican cause; He tried to organise a volunteer air force (Escadrile Espana) on the republican side but as a practical organiser and squadron leader he was somewhat idealistic and inefficient. The Regular Spanish Air force commander Andres Garcia La Calle was openly critical of Malraux’s military efficiency but recognized his usefulness as a propagandist. His novel L’Espoir and the film version he produced and directed (Espoir: Sierra de Teruel) were a great help for the republican cause in France. Even after covert support by France to the Republicans ended in December 1936, the possibility of French intervention against the Nationalists remained a serious possibility throughout the war. German intelligence reported to Franco and the Nationalists that the French military was engaging in open discussions about intervention in the war through French military intervention in Catalonia and the Balearic Islands. In 1938, Franco feared an immediate French intervention against a potential Nationalist victory in Spain through French occupation of Catalonia, the Balearic Islands, and Spanish Morocco. Besides the generally Republican-oriented sympathies and support in France, some right wing extremists sided with Franco, most notably the members of La Cagoule who where instrumental in sabotaging ships transporting guns and civil relief equipment to Republican Spain in French ports. Beside the common knowledge and facts explore some more fascinating (lesser known) facts about this ideologically fraught conflict, which resulted in a decades-long Franco dictatorship. A cadre of rebel army officers began plotting to overthrow the government as soon as a leftist coalition won Spanish elections in February 1936. Gaining the support of General Franco at the final hour, they called for a July 18 uprising in Spanish Morocco, followed by a general uprising a day later, that they envisioned as a rapid coup d’état. But although they captured Spanish Morocco and the conservative heartland with barely a struggle, the Republican government retained about two-thirds of Spain, including most major cities. As civil war subsequently erupted, Franco ferried his battle-hardened troops from Morocco to the mainland—using planes and boats provided by Benito Mussolini and Adolf Hitler—and began marching northward toward Madrid. Though a key contributor to the coup, Franco didn’t originate the plot and was never supposed to lead the country. However, the rebels’ purported first choice for head of state, General José Sanjurjo, died in a plane crash just days after the uprising began while returning from exile in Portugal. Around the same time, Republican forces took out several of Franco’s other potential rivals, including monarchist politician José Calvo Sotelo, fascist politician José Antonio Primo de Rivera, and generals Joaquín Fanjul and Manuel Goded. By October 1936, Franco had been named commander in chief of the armed forces and head of the rebel Nationalist government. His final near-equal, General Emilio Mola, the technical mastermind of the coup plot, then died in a June 1937 plane crash, leaving him firmly and solely in charge. While the Nationalists largely united behind Franco, the various Republican factions were constantly at each others throats. Tensions came to a boiling point in May 1937, when a police raid on the anarchist-controlled central telephone exchange in Barcelona sparked days of street fighting that left hundreds dead. This so-called civil war within the civil war, which pitted anarchists and anti-Stalin Marxists against Soviet-backed communists and the regional government, resulted in the communists—and hence Moscow—increasing their control over the war effort. Anarchist and anti-Stalin Marxist organizations were suppressed, and the revolutionary egalitarian fervor that had once gripped Barcelona died out. From the very beginning, Franco’s Nationalist troops initiated a campaign of terror in which they killed, tortured and shamed perceived political opponents. In August 1936, for example, they gunned down up to 4,000 alleged Republicans in the town of Badajoz and then burned the bodies at a local cemetery. Similar massacres occurred in Málaga, Toledo and elsewhere, each time with the tacit approval of the rebellion’s top leaders, such as Mola, who declared at one point, “We have to create the impression of mastery, eliminating without scruples or hesitation all those who do not think as we do.” (Another Nationalist general was quoted saying, “I authorize you to kill like a dog anyone who dares oppose you.”) Though less systematic, Republicans committed their own share of atrocities, including the slaying of thousands of Catholic priests, monks and nuns, as well as a mass execution of alleged fascists just outside Madrid. In total, it’s estimated that the Nationalists murdered about 150,000 prisoners of war and civilians over the course of the conflict—plus another 20,000 following their victory—compared to about 49,000 murders at the hands of the Republicans. Although the U.S. government stayed neutral in the Spanish Civil War, about 2,800 Americans—many of whom had never before fired a gun—volunteered for the Republican cause. A diverse bunch, their unit, the so-called Abraham Lincoln Battalion, included a vaudeville acrobat, a rabbi and the first African-American ever to lead white troops into battle. Morale quickly deteriorated, however, after they were forced into several ill-advised charges against entrenched opposition. “We are shock troops,” a wounded American reportedly said from his hospital bed. “The Republic had to push some meat out there in front, and we were elected.” By the time the Lincolns departed Spain in October 1938, more than a quarter of them had perished. The roughly 40,000 international volunteers from other countries didn’t fare much better, suffering casualties at a far greater rate than the Spanish members of the Republican army. No more than a handful of Americans fought with the Nationalists. But Franco did gain the vital support of Texaco chief executive Torkild Rieber, a Norwegian-born American who admired Hitler and allegedly preferred doing business with autocrats. From his office high atop New York City’s Chrysler Building, Rieber illegally sold the Nationalists discounted oil on credit and illegally transported the fuel in his company’s own tankers. His worldwide network of employees passed along the whereabouts of Republican-bound oil shipments, thereby leaving them open to attack. For these blatant violations of U.S. neutrality acts, Texaco (now part of Chevron Corp.) received only a small fine. Despite the danger, writers flocked to Spain during the civil war, with some fighting on the front lines and others filing articles from such places as the Hotel Florida in Madrid, a famed literary hot spot. “The Little Prince” author Antoine de Saint-Exupéry even flew his own plane to report on the conflict, whereas George Orwell survived a bullet wound to the neck while serving with a Republican militia. The poet Federico García Lorca, meanwhile, was assassinated by a Nationalist death squad. Other well-known literary figures in Spain at that time included Ernest Hemingway, Pablo Neruda, John Dos Passos, Langston Hughes, Dorothy Parker, Lillian Hellman, André Malraux and Arthur Koestler. Artists likewise produced numerous memorable works about the war, most notably Pablo Picasso, whose painting “Guernica” depicts the bombing of a defenseless town by Hitler’s Condor Legion. 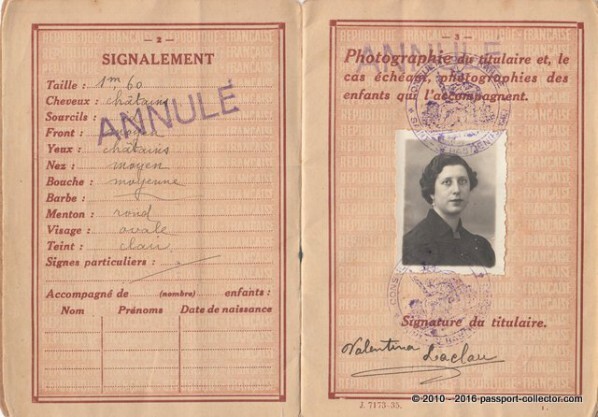 Issued for a woman 1937 in Spanish San Sebastian and several times extended until 1943 with two visa special France-Spain. 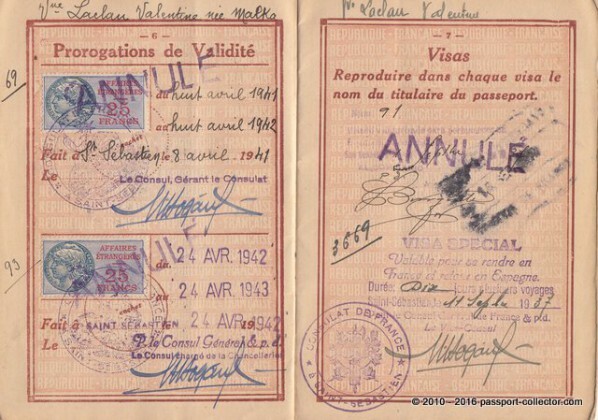 During the civil war international passports were usually NOT valid for Spain!